VANCOUVER, British Columbia, - March 16, 2004 – Mayfair Lakes Golf and Country Club, British Columbia’s world-class, 18-hole, Les Furber-designed golf course in Richmond is kicking off the 2004 season with greater fanfare than usual. The kick-off includes the launch of Inforemer, the flagship product designed and developed by GPS Industries, Inc. (GPSI - OTC BB: GPSN, Germany: Berlin and Frankfurt WKN#: 252179). Mayfair Lakes is the first golf course in Canada to offer a full management GPSI system. With the towering backdrop of the North Shore Mountains, Mayfair Lakes offers country ambiance only 20 minutes away from downtown Vancouver. The 6641-yard championship course challenges golfers by virtue of the numerous lakes and waterways that need to be navigated on 13 of its 18 holes - a perfect place to showcase Inforemer’s brilliant color screen displays and all the benefits it brings to the golfer’s experience. GPS Industries is a leading developer and provider of global positioning golf course and sports solutions who has introduced a set of industry firsts in products and functionality this year. The Inforemer is now positioned as a total business solution for course managers, recognizing a paradigm shift in the industry and shattering the perception of GPS primarily as a distance tool. The company’s impressive array of product enhancements includes the industry’s first color handheld GPS mobile display unit. GPSI also recently announced a real-time streaming media partnership with CBS Sportsline; the industry’s most comprehensive tournament management and leaderboard solution; and the introduction of InforeZone™ Wi-Fi HotSpots. In addition, GPSI is the industry’s only provider to offer a mix-and-match solution including handheld and cart mounted GPS units, and the only provider with multiple language capabilities. Since 1989 Burrard International Inc. has been creating or acquiring premium championship golf destinations in British Columbia and, recently, in Hawaii. Their courses are consistently ranked among the highest throughout Canada and have played host to Jack Nicklaus, Tiger Woods, Greg Norman, Fred Couples, Nick Faldo and other top professionals in the sport. Today, Burrard International proudly promotes all of their golf facilities to players under one organization called GolfBC. 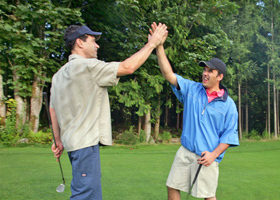 For more information, visit their website at www.golfbc.com.